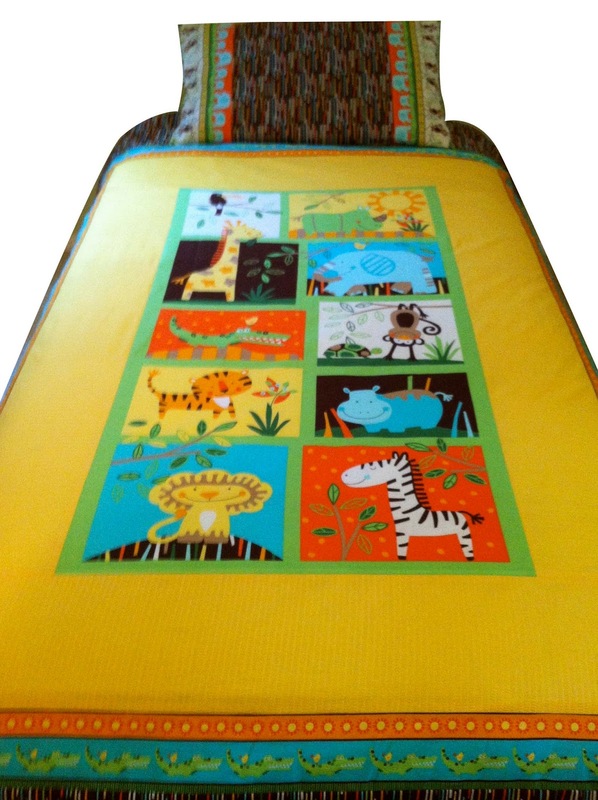 Introducing Jungle Bunch, licensed by Timeless Treasures. 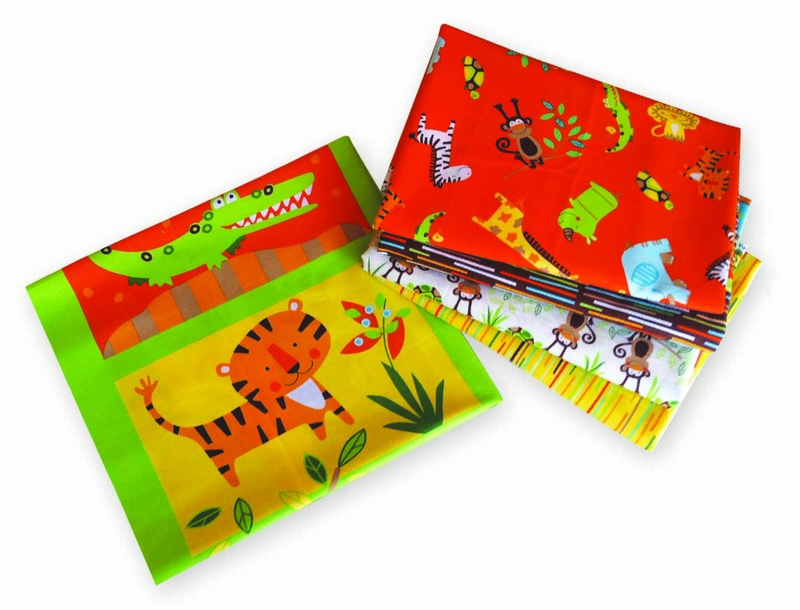 This is a wonderful collection for a baby or young child. 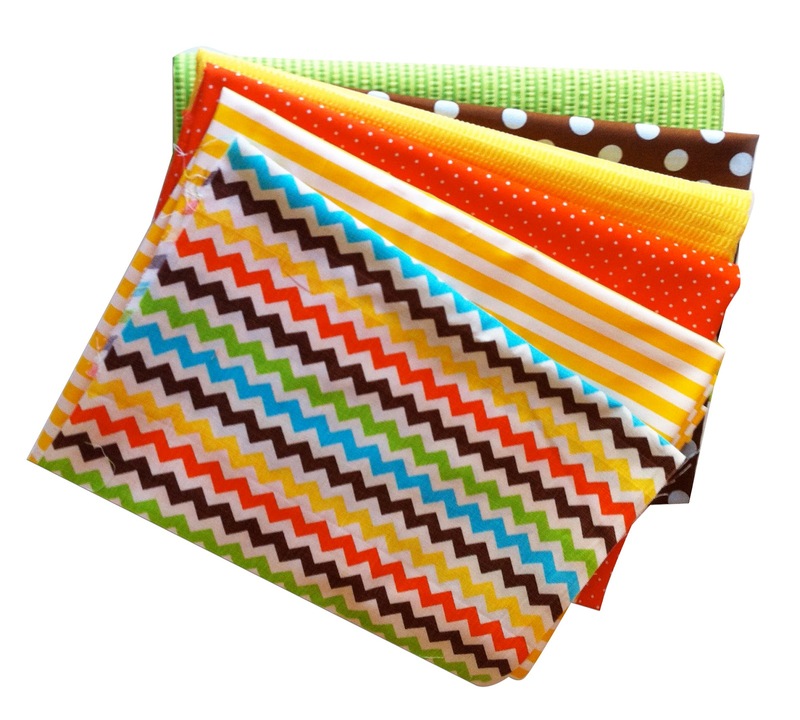 It is vibrant and fun and the fabrics are available to make your own fun quilt or cover. 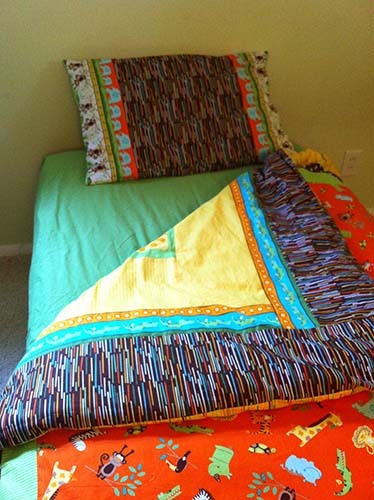 I just loved coming up with the fabric combinations to make this reversible duvet cover and pillowcase for my 7 year old, Chet. 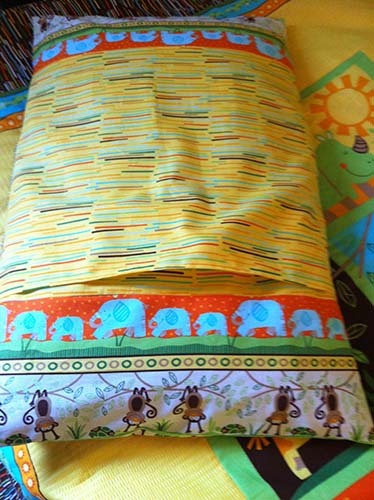 For the pillow case I used the yellow multi stripe print in the center of one side and the brown multi stripe print on the other with the border print of elephants and playful monkeys hanging from vines on both ends. The reversible feature gives variety on any given day. 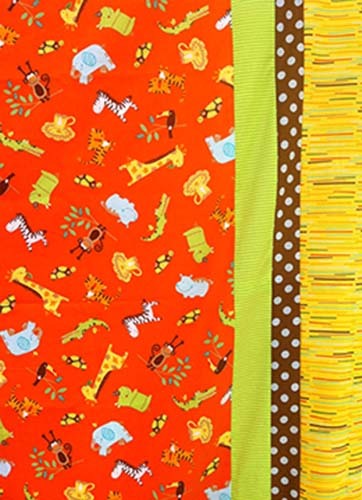 The orange toss of animal fabric is the dominant feature on one side with some fun two-toned complimentary fabrics…the final border being the multi yellow stripe. The large panel piece has the bold, playful Jungle Bunch icons with fun patterns in little settings in nature. Here is a close up of the border for this side of the duvet. 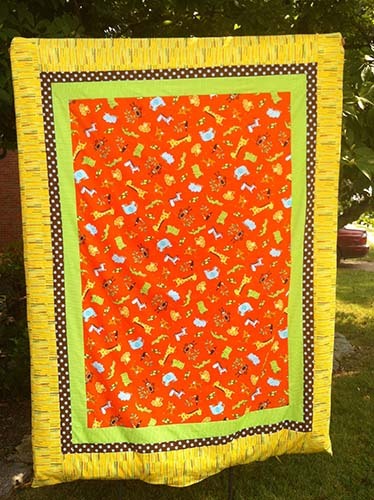 I really like the way the turquoise border with green alligators pop against the yellow and brown. Chet especially likes the brown. 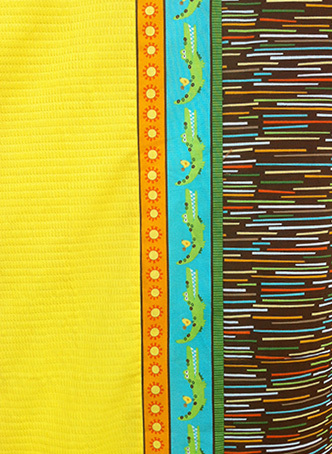 I found a few two-toned fabrics that complimented the fabrics from Jungle Bunch. I also noticed that I had a chevron swatch called (Ziggy) from Timeless Treasures that was a great match with this collection. This would make a great accent pillow or backing to a baby quilt. My hubby stood on a chair to hold it up, so I could take a picture. I am pleased with the final results. There is an opening at the bottom in the middle, so that the interior purchased at Ikea can be placed inside. I like duvets because they are easily washable. 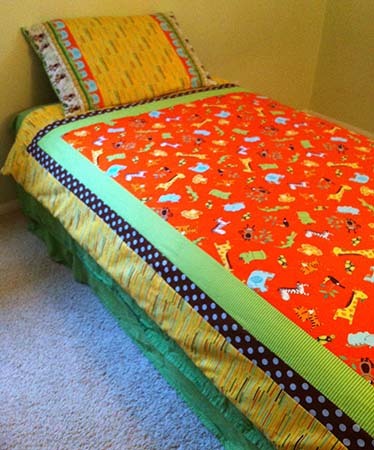 I keep it fresh by changing out Chet and Chloe’s bedspreads with new designs. This is a very happy collection. 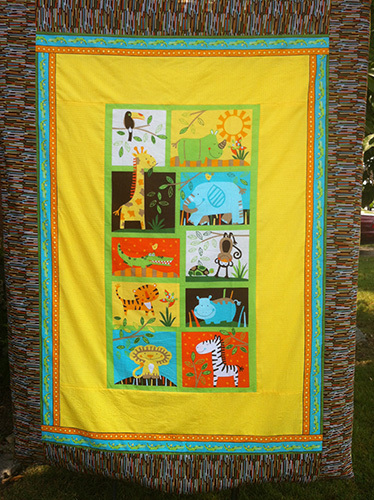 Look in your local quilt shop or on-line for Jungle Bunch! Enjoy and share anything you might do with this group. We’re still in summer. In fact next week, it is supposed to get in the 90’s! So why not get an adorable skirt for Curious Georgia for your little one? Purchase one, and get the next one for 50% off! 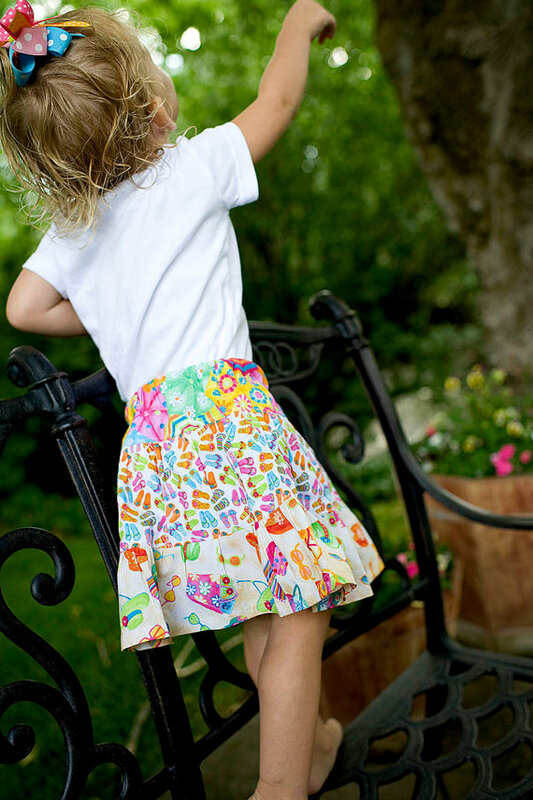 This skirt is a compilation of the Flip Floppin Summer Fun fabric I did for Timeless Treasures. Here are some links below to different on-line shops. 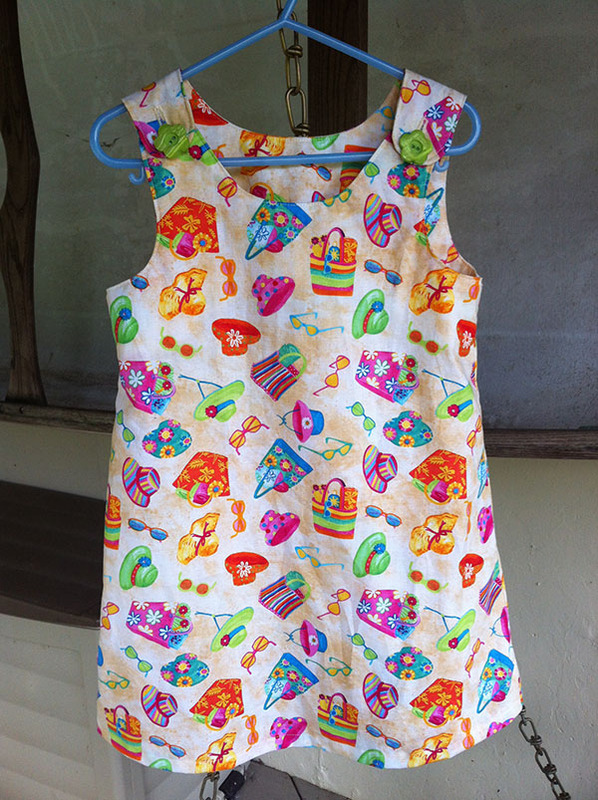 And, here’s a little dress with little pictures of summer hats, sunglasses and beach bags I made for more inspiration. With over 1500 entrants from 30+ countries across the world, the competition was fierce, as Lilla Rogers states. I am so happy and proud to be a part of this! Here are the other Lilla Rogers Global Talent Search semi-finalists. The next part of the competition is coming up, so stay tuned.